Ask fellow campers about " Picketts RV Park (formerly Alamo RV Park)" and nearby attractions. Great for overnight. 1 1/2 hours north of Las Vegas on hwy 93. Big gravel parking lot, good hook ups, inc. Descent cable and good park internet. Will stay again on way through. We camped at Picketts RV Park (formerly Alamo RV Park) in a Motorhome. 1 1/2 hours north of Las Vegas on hwy 93. As others have reported, the staff is very nice and helpful. Otherwise I would have rated the park lower. The gravel sites are very close together, cable TV was fuzzy and the surroundings less than pleasing. OK for overnight and that's pretty much the extent of their business. They offer propane. Verizon signal 3G only. We camped at Picketts RV Park (formerly Alamo RV Park) in a Motorhome. On the way south we just needed a place for the night, and that is what this RV Park is for. Friendly staff in the office and out in the park which is basically a level gravel parking lot with hookups, all working. 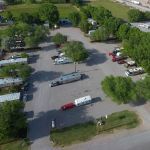 Each site is long and wide enough for big rigs with slideouts and awning, standard hookups with 50 amp power, water with enough pressure, sewer and WiFi which worked fine and cable TV. I didn't try satellite but it might work on most of the sites as the trees are only on one side of the park. Washrooms and office are in a trailer, clean and functional. We would stay again at this park when driving through. We camped at Picketts RV Park (formerly Alamo RV Park) in a Motorhome. Pros: This is a very clean park with level sites. The Wi-Fi is better than most we have been in. Cons: The managers (dog owners) seem to hate other pets. We were scolded about making sure that our dog did not relieve herself on the property of the park. We were suppose to make sure that the dog was off property and behind the fence first. One of our group was taking her dog off property when the dog had to take a leak while still on property. She was scolded about allowing her dog to desecrate the grounds. The sites are very narrow and while it was nice to have our group parked next to each other my bay doors would hit the slide out of the next RV if I opened it all the way. We were warned about excessive water pressure so we used a pressure regulator. The problem was that if we turned on the water, there was an underground leak in their system that caused our meeting area to flood. When I mentioned this to the manager, I was told that the owner would not authorize repairs. We camped at Picketts RV Park (formerly Alamo RV Park) in a Motorhome. This park is not fancy; however, it is a good spot to stop and rest after a few long days on the road. The lots are level and it has easy access. The hosts are very friendly and the town is quiet. We received a 50% discount for staying for a second day. We camped at Picketts RV Park (formerly Alamo RV Park) in a Motorhome. Long, level, gravel sites, only one or two with shade. Easy in/out for big rigs. One block off the highway, very convenient for an overnight when in this area. Friendly staff. We camped at Picketts RV Park (formerly Alamo RV Park) in a Motorhome. What can I say? You are in the middle of nowhere and it's about the only game in town. The good things: (1) new, nice, and clean restrooms and showers; (2) free cable with plenty of channels; (3) free WiFi that actually works, is usable, and is fast; and (3) friendly and helpful owners. The bad thing: (1) the ambiance here is zero (close side-by-side gravel sites.....this not a place where you want to sit out under your awning and take in the view), and (2) lots of permanent residents ringing four sides of the park, with the usual issues (e.g., old trailers, way too much "stuff"in the yard. loose dogs, etc.) Not certain I'd stay here again. We camped at Picketts RV Park (formerly Alamo RV Park) in a Fifth Wheel. Nice grocery store and gas station right next door. Old mines, ghost towns, wildlife preserves, state parks and hot spring all with in short drives. Sinclair fuel stop with separate diesel pumps (handle big rigs) and a convenience store. Very small town USA. The Alamo Truck Stop is closed. Diesel is available at the Sinclair in Alamo which has truck/big rig pumps. Diesel is also available at the Shell station in Ash Springs. Are you affiliated with Picketts RV Park (formerly Alamo RV Park) ?